1. AccuWeather By AccuWeather, Inc.
Get the most localized and accurate weather information from anywhere at any time with the newly redesigned AccuWeather application for iPhone! With GPS technology and new, interactive Google™ maps, the application makes it possible for you to get detailed and up-to-date weather forecasts and news wherever you are in the world. •Accurate, localized forecasts for all global locations. Updated every hour, forecasts include the most detailed hourly forecasts for each of the next twenty-four hours, plus day and night weather forecasts, news, and information for the next fifteen days. 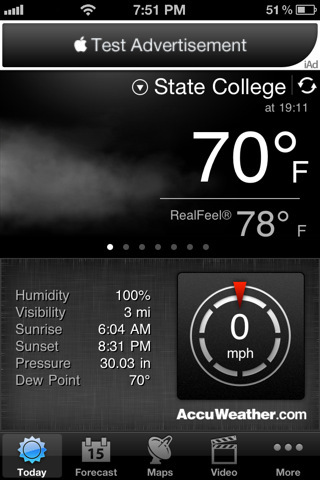 The award-winning My-Cast app delivers comprehensive yet intuitive weather information specifically for the iPhone and iPod Touch. Un-cluttered base maps display animated radar, clouds and StormWatch severe weather alerts allowing effortless interpretation of how the weather affects your day. As you check out the current weather, you may see drifting clouds or falling rain as My-Cast’s distinctive weather themes come to life. Whether you are interested in weather for today, tomorrow or next week, My-Cast has you covered. 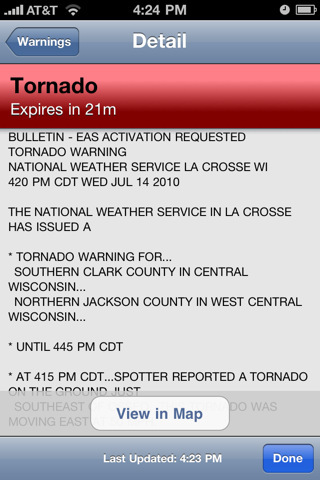 When severe weather strikes, My-Cast transmits the latest alerts direct from the National Weather Service. RadarScope is a specialized display utility for weather enthusiasts and meteorologists that allows you view NEXRAD Level 3 radar data along with our most requested new feature, Tornado, Severe Thunderstorm, and Flash Flood Warnings issued by the National Weather Service. It can display the latest reflectivity, velocity, and other products from any NEXRAD radar site in the United States, Guam and Puerto Rico. These aren’t smoothed PNG or GIF images, this is real Level 3 radar data rendered in its original radial format for a high level of detail. Looking for the most accurate weather information available? The Weather Channel’s staff of 200+ meteorologists, along with our patented ultra-local TruPoint(sm) weather technology, allow us to provide you with the weather tools you need to plan your day, week, or even the next hour. Access the largest network of professional weather stations in North America and thousands of locations around the world! WeatherBug Elite brings the most accurate, reliable and timely weather information directly to your phone. Complete with Doppler radar, severe weather alerts, maps, forecasts, widgets and much more, WeatherBug Elite is the most comprehensive weather app available. Best selling weather radar app! Simple, fast, easy to use, gorgeous animated graphics. Includes full animated coverage of the entire U.S., as well as the latest radar imagery across the globe overlaid on three styles of scrollable, zoomable maps. 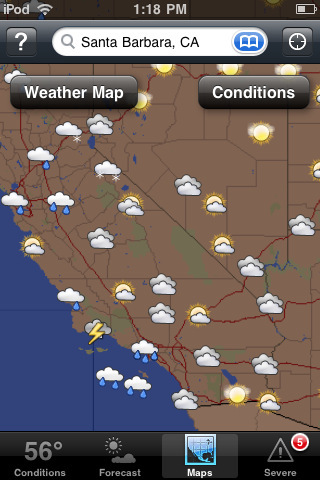 The fastest, easiest way to view local weather radar on your iPhone. A single click and the Weather Radar automatically determines your location and finds the closest doppler weather radar. Animated, rich graphics show you the direction and progress of nearby storms and clouds. Weather Planet-A slightly cooler way to look at the same old weather. •Realistically displays the earth from thousands of miles up in space •Uses current weather satellite images for constantly updated cloud cover. • Watch the seasons change as the snow cover drifts south in the winter and recedes during the summer •Select from thousands of cities and towns. •Label the constellations in background •Jump out to the moon for a look back at our home-world •News alerts bring up to date info on weather, astronomy and space events.